Where we are - bellavistaligurias JimdoPage! 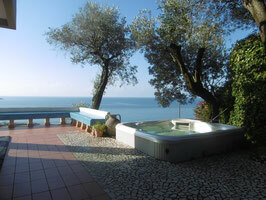 The house is situated in 800 meters from the sea, near the village of Cavi, on a hill. The place is saturated with peace and tranquility, and opens an amazing view to the picturesque surroundings. The beach is situated in 5 minutes walk from the house. The city of Sestri Levante is located in 2 km from the house, while the Five Lands (Cinque Terre), as well as the cities of Genoa, Portofino and Camogli can be reached in 30 minutes. Take the highway A7 (Milano-Genova) direction Genova, then A12 (direction Livorno); having reached the city of Lavagna, drive off the highway, then turn to the left and drive down in the direction of the sea. Having arrived to center of Lavagna, drive along the street Via Aurelia in the direction of La Spezia – about 2 km – until you see the village of Borgo di Cavi di Lavagna to your left; turn here, and enter the village. Drive in the direction of the mountains, holding to the right – about 200 m, until you see the street Via della Pineta (which is also called Via Panoramica) to your left; a few more turns – and you have arrived. For those who arrive from Rome – Pisa - La Spezia: take the highway A12 (direction Genova); at Sestri Levante drive off, and follow the signs for Genova; having left the town – and driven through the galleries - you will see the village of Borgo di Cavi di Lavagna to your right. Turn here, and enter the village. Drive in the direction of the mountains, holding to the right – about 200 m, until you see the street Via della Pineta (which is also called Via Panoramica) to your left; a few more turns – and you have arrived. Take the line Genova-Livorno , get off at Sestri Levante. The house is about 2 km from the station, and can be reached by taxi.